While those jobs are still available, you should never base your law firm choice on the money they pay. Summary: Learn why money should never be your first focus when you are trying to decide which law firm you should join. One of the most dumb and detrimental things I see among law students, associates and partners is a consistent focus on money above all else. More often than not, this focus destroys careers—and even lives. As a preliminary matter, it is important to understand that the practice of law is about far more than money. Maintaining a career in law requires an emphasis on factors other than money. When attorneys put themselves in positions where money is overemphasized, they tend to find their spirits crushed. They end up unemployed, underemployed, or bouncing around between jobs. How important is money to you in your career? What amount would you like to be making? Let us know in the comments! See Never Focus on the Money: Focus on Your Higher Purpose and Contribution for more information. People who decided to practice law used to aspire to careers where they could work with like-minded individuals who wanted to protect and advance them. These supportive co-workers and superiors would give them interesting work, help them generate business, be friendly with their families, be there for them when things were good and not so good, and make them feel like a part of their own families. When you work at that kind of ideal firm (and they do exist! ), with a group of like-minded people, you wake up each day feeling confident and good about yourself, your common mission and your prospects. These qualities are very important in a firm and their significance cannot be underestimated. It is important for people to feel valued, protected and safe. Attorneys who work in these kinds of firms enjoy the practice of law, are happier at work and outside of work, look and feel better, are healthier, live longer, and have better and more satisfying careers all-around. They have far fewer psychological problems than attorneys grinding away at other firms where money is the ultimate and only motivating force. Do you want to spend your days (and nights) with a bunch of people you feel threatened around, who are hostile to your advancement and happiness? One of the interesting things I see all over the United States is the dichotomy between very developed and not so developed markets. Examples of very developed markets are Los Angeles, San Francisco-Palo Alto, and New York City. Examples of less-developed markets are Sacramento, Detroit, and Rochester-New York. There are major distinctions between these markets and they are crucial to understand. What happens to most people who join one market and not the other is profound because the career trajectories are so different. If you join a major law firm in a market like Palo Alto, the odds are very good you will not be working there a few years hence. If you are still working there after a few years, there is a strong possibility that your firm may have changed its name or absorbed a smaller firm, that the people you started work with will be gone, that there will be many new faces, and in general a lot will be different with the firm from when you joined there. Very, very few people will spend their entire careers with that law firm because that is not what people do. They will go in-house or to other law firms. Partners will be lured away for money. There will be few older partners in the law firm and certainly very few people in their 60s practicing there. If there is a market slowdown, the firms in Palo Alto will let thousands of attorneys go. These kinds of firms are run like well-oiled machines and hire and fire very quickly. The human toll is meaningless to them. It's all about the money. When you sign up to work for large firms in any major city you are making this trade off. When things get tough, and they always do, you will be cast out on the street and have no one to protect or shepherd you through. Countless careers come to an end in these law firms when the market slows. It doesn't matter if you're a partner, associate or counsel. When the gravy train stops so does your job—and often your career. Droves of talented attorneys around the country stop working after every recession—especially in large markets. Recessions and work slowdowns ALWAYS come, and when they do many attorneys lose their jobs. Conversely, if you join one of the larger law firms in a major market like Detroit, things will be far different. Detroit is not a giant legal market and firms there do not traditionally hire too many people. People that join such firms typically do not have a lot of options to move to similar firms later on, as the market is smaller. There are less than 10 prestigious, large law firms in the entire city. Because these law firms protect their own, partners and associates are typically safe from layoffs during recessions. Many partners are allowed to continue practicing into their late 70s; they are given Of Counsel and other titles but still have a home. For the most part people settle down, start families, buy houses, do not work crazy hours and live pretty normal lives. They don't make Palo Alto salaries, but they feel safe, the environment protects them, the cost of living is cheaper, they make good money, and everyone works together as a "tribe" to protect one another. This is how law firms have worked for generations. This is also how people have long-term careers as attorneys and stay happy and sane. What kind of law firm do you currently work at or wish to work at? Does it have this kind of stability? In large markets like Palo Alto there are, of course, smaller law firms that protect their own and are good places to work. However, these law firms are less "alluring" to young, accomplished attorneys who seek a higher salary and more prestige. Few attorneys have the wisdom to seek out smaller law firms that will protect and advance them compared to larger law firms. The sad reality is that most attorneys never understand this because they are influenced to the point of indoctrination; they believe that making the most amount of money is always the best course of action for them to take. They do not understand the profound tradeoff they make when they trade security and happiness for the fattest paycheck. Everything comes with a price. Law firms and legal environments that are based on the bonds of money are not, by any stretch of the imagination, "tribes." These kinds of money-driven firms are autonomous groups of people; small groups of partners function as journeymen missionaries, out for their own self-interest and willing to sacrifice their peers, switch sides and leave at the drop of a hat. There is no connection to the group, no loyalty and once the money stops the people leave. If the money slows down, the law firm powers-that-be will let anyone and everyone go in their quest to keep more money for themselves. Families, connection to the community and so forth do not matter; these people are simply out for themselves. External threats such as changes in the business climate, the inability to hold onto various clients, and competitors trying to steal business. Dangerous internal threats, such as political threats from fellow attorneys, layoffs, not making partner, getting a bad performance review, being demoted from an equity partner to a non-equity partner and more. The list of law firms that have failed based on the "bonds" of money is lengthy, and includes Finley Kumble, Brobeck, and Dewey LeBoeuf. These kinds of firms create barriers to cooperation and to everyone's long-term success. When attorneys start their law careers, they generally have a certain amount of energy, spirit, enthusiasm, and confidence. Some attorneys even possess a surplus of these inspiring qualities, which they use to constantly "replenish the tank." To continue practicing law, they need to put themselves in positions where they are continuously feeding that tank and making sure it stays full. When you find yourself in a position where the tank is not being replenished—and many attorneys sooner or later find themselves in that exact situation—it's not good. In fact, it's time to immediately seize control of things and take your future success and happiness into your own hands. To illustrate this point, one can compare a promising young attorney to an expensive racehorse. When the expensive racehorse with a good pedigree begins to race, it is well-fed, not over-raced, taken to health check-ups, allowed to rest, put in a comfortable environment, and given the best care its owner can afford. This "special" horse is combed, petted, told it is special and loved by its owners and a legion of people looking out for it. It is socialized with other horses, allowed to roam the fields and recharged between races. People do this with a $500,000 racehorse because it is valuable and there are not many of them. If there was an inexhaustible supply of these racehorses, things would be different. If that same racehorse was not maintained continuously, was told it was bad after every race, was raced to the point it was exhausted and could barely function, was locked in its stall without being allowed to socialize, was not fed well, and was put around a bunch of hostile horses that were always attacking it, this horse would soon be limping along and unable to compete at all. The horse would not be fit to compete in any race—regardless of how prestigious that race was or if it was in a small town or major metropolis. The horse would soon have psychological problems and might even go crazy. To keep the horse running and making money, the owner might pump it full of stimulants and antidepressants—but that can only work for so long. If the horse had an injury and was not allowed to race for a few months, those few months might be the best of the horse's life. If you asked the horse if it was interested in racing again, its response would most likely be, "Hell no. No way." If you asked that horse if it was interested in running in smaller races with less pressure than the major races it used to compete in, the horse's response would still likely be, "Hell no. No way. I'm used to running in the big leagues. I'm not going to stoop so low in the eyes of the other horses and run in small events." This is what happens to attorneys focused on money. When they join a large, high-paying law firm the firm is not very concerned with maintaining them. The law firm simply wants as many hours as possible out of the attorney and wants to make as much money as possible. Instead of encouraging the attorney, the firm surrounds him in a hostile environment and pushes him down. Because the attorney is earning so much money, mistakes are treated harshly, social forces are more intense and the threat of being replaced is present at all times. It's as if there is a constant supply of new racehorses available. If one stops performing it is pulled out of the race and replaced with a shiny, new racehorse ready for more abuse. The focus on money is something that hurts attorneys because law firms charge a corresponding price for the amount they are paying the attorney. The price is that the attorney may be so beaten-up after a few years that he or she never practices law again. The lesson is this: If you are a promising racehorse attorney, you must do everything in your power to understand your true worth (not billable hour worth) over time! You must put yourself in the hands of a racing team that values you for the long-term! When you focus on money at virtually any stage of your career, you are making a series of mistakes that you may not even realize you are making. You must understand the following stages, regardless of where you currently are in your career. Have you made this mistake? What did it take to correct it? Will be grateful for their job, settle in and do the work enthusiastically, believing their job is the best they can get. Will be around a group of like-minded people and will learn from them, commit to their practices and start getting experience right away. Will most likely not be working crazy hours and will not start dreaming of another career. After six or seven years, will likely be practicing law with the same sort of law firm. They will have settled in and be on their way to making partner (if they haven't already made partner). Will be making a good income, and will likely have started a family, have purchased a house and be living a fairly happy life. Will likely not be plotting an escape from the practice of law. But what of those "top" students? If you are one of them, you will join your huge New York law firm and encounter some of the most competitive and unpleasant people you have ever met. From the day of your orientation, you will be stunned that various attorneys are telling you how they are "going to do this for a few years and then go in-house," and you are not even sure what that means. The attorneys you are working with are nice enough, but you soon realize they are not like people you have encountered before. You ask your peers questions about assignments, they give you elusive answers and are not really helpful—you realize they may be trying to undermine you. You start seeing your peers working ridiculous hours on various assignments even when they do not need to so you start doing the same. You realize that many people are undermining you and playing games with you behind your back—and other's backs. Your peers spend their time saying negative things about other attorneys you are working with and it is not a positive atmosphere by any means. 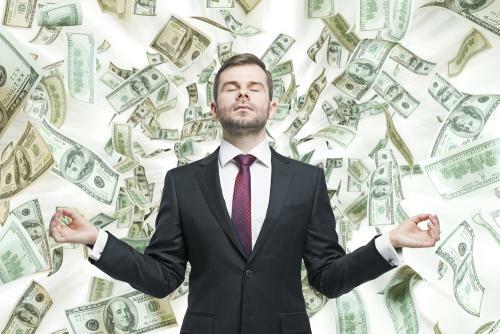 Your peers seem to obsess about the bonuses they are going to receive and the salaries that people are making at other law firms. They seem extremely concerned with money and people start jumping ship and trying to get jobs at firms that pay more. The attorneys in your firm seem to delight in bad news and reading and gossiping about attorneys and firms that are having problems. You start getting performance reviews that you believe are unnecessarily harsh and unfair. No one seems to appreciate your hard work. You start seeing people leave the firm every month or so. They just keep leaving and it does not make sense to you. When they leave, even more competitive people quickly take their places. You learn that it is almost impossible to make partner in the law firm you are in. You start wondering what the point of all of the hard work is—and as you are sitting there several days a week until midnight and later—you start to get a bit confused about why you are doing this if there is nothing on the other side. Moreover, there are people who are frequently in their offices all night and until 3:00 or 4:00am. Some don't even go home, but catch a few winks on the floors of their offices every now and then. They work much harder than you do! Many of them are using drugs to keep up and you are not sure you want to go that route. You start getting exhausted from all of the work, the constant negative feedback and more. You start thinking about changing your practice area, going in-house, or doing something else. You start wondering if there is something wrong with you that you do not like any of this. Many people you know are seeing therapists, using too many substances, having serious relationship problems, thinking of quitting and not enjoying their jobs. Every now and then an attorney in your firm is hospitalized or does something that suggests they have gone off the rails. You move to another large law firm, but do not like it there either and then move to another. You then quit that firm to take some time off to get yourself together. You take a low-stress job doing something that you think looks admirable while you figure it all out. You would like to go back to another smaller law firm, but do not think that it pays enough and is not prestigious enough. Also, some of the people you worked with in the larger law firm are now making partner. How would that look to them? Maybe you should quit practicing law altogether? You do not have a house, a group of people you are working with who are protecting you, a family, or a future at any firm. You are depressed. You feel used up, unenergetic and uninspired. You are single and do not know what you are going to do. But you are far from alone. The scenario described above is unbelievably common. In my recruiting practice I hear about this all the time, in numerous conversations I have with attorneys across the country. These attorneys are typically disillusioned and unhappy. While there are many aspects at play, the focus on money is a driving factor behind all of these issues. Without the focus on money and what others think, most of these attorneys would be happy and have more satisfying and long-standing careers. If this was your experience, did you quit the law firm? How did you address it? Attorneys who leave often start doing things like going on yoga and spiritual retreats and trying to "find themselves." They may go to therapy, join Alcoholics Anonymous (even if not alcoholics), or do other things where they are trying to put themselves among groups of people who make them feel supported. They are alienated because they are part of a system that has never supported them and they feel so very alone. They may join religious groups, or do other things where they are seeking this connection. They may cycle through all sorts of unproductive relationships where they are looking to feel important and loved—and where they cannot possibly give love because they have been so unloved and are so damaged from their former positions. There is also a whole ego-focused mentality that I am not going to get too much into here, but will touch on briefly. Concerned with how they look and are perceived by the world, these attorneys try to make each thing they are doing look very important and significant to the world. They may be scraping by with no money but want their former large law firm, prestigious law school peers and the world to think what they are doing is very important. When they realize that others do not think what they are doing is important, they may withdraw and stop socializing or speaking with those people out of shame. They may then continue to feel worse and worse about themselves. It can take these attorneys years to recover from all of this—if they ever recover. Some of the most distressing moves I see are from experienced attorneys with anywhere from one to ten years of experience who are not partners. These attorneys could be coming from giant, high-paying law firms, or they could be coming from smaller law firms and getting offers at a variety of large and smaller law firms. When confronted with competing offers and opportunities, these attorneys almost always choose the higher paying offer. There could be as little as $15,000 or $25,000 involved; it makes no difference. When it comes right down to it, these attorneys focus on money and not the sort of firm they are joining or what this means for their long-term success. When I was practicing law my father told me on at least a few occasions, "Once you get paid a certain salary, that is your rate and you never have to take less than that again." I do not completely understand this middle class thinking—and it is middle class; however, the problems with this sort of thinking in the legal career space are profound and are governed by a lot of "not-so-visible dynamics" that are constantly operating inside of law firms and beneath the surface. Is there a certain salary that you set as your minimum? "Will I Continually Have Access to Work?" The more experience an attorney gets the less marketable he or she is likely to be. There are multiple reasons for this, but the main reason is because older attorneys have higher billing rates and are perceived as "less hungry" than younger attorneys. Because they have higher billing rates, partners need to share more high-billable, hourly work with them. Most clients want partners with similar higher billable rates to do the work themselves, or have lower-paid associates doing the work. Am I going to be working with a partner who has a lot of work? What happened to the person in the position before me? Am I being hired to work on matters that the firm has traditionally had a lot of work in? Can I make partner working on firm-generated work? For how long has the firm had all of this work? Is the firm's work mainly from one client, or a variety of clients? All of these matters are relevant to whether you should join a new law firm. The ability of the law firm to pay your salary over time and not just in the short run is extremely important—more important than whether or not you can make $20,000 more over the next few years. "Will I Feel Protected with the New Firm Compared to Where I Am Working Now?" Is the firm known for layoffs? Am I going to be working directly for a partner (or group of partners) known to have a lot of business? Does the firm seem interested in me as someone to be with them over the long-term or not? Am I being brought in to work on matters for one client, or several matters for multiple, long-standing firm clients? Is the firm suddenly rushing to hire a bunch of people due to a sudden explosion of work, or are they bringing me in to fill a vacancy left by someone who was with the law firm for a long time? Do I like the people I am going to work with? Do I feel comfortable around them? What does my "instinct" tell me about the smaller and larger firms where I have offers? These questions are important and meaningful to any job search. They are more important than money. What are the main questions you have asked during your job search? There are many firms around the country that are composed of people of different "tribes"—religions, ethnic groups and so forth. In many smaller cities in the South, many of the attorneys may have gone to the same high schools. In markets like Los Angeles, there are even many firms that are composed of mainly Jews, Mormons and other religious and ethnic groups. Many law firms are composed of conservatives and others are composed of liberals. Some law firms are composed of people who predominantly went to the same law schools. Other law firms are made up almost entirely of people who grew up in and are from the area. You are always going to be much, much better off when you join a law firm that is composed of people from your same "tribe." Law firms that are made up of people from your tribe will want to protect you because humans are tribal animals. If they fire you inappropriately, or lay you off, they will have to be reminded of how they treated you to other members of the tribe all the time. Tribes protect their members and you want to surround yourself with tribe members every chance that you get—regardless of money issues. Large, international law firms are rarely composed primarily of members of one tribe. Because they are so diverse, there is less opportunity for these law firms (or people in them) to protect you. Because they have no interest in protecting you, the only bond you may have with them is the amount of money they pay you. That bond is very weak and can break at any moment. Each law firm, of course, will have members of various tribes within it. If you are hired by and receive work from someone who goes to your church and socializes with your family, this is an excellent source of insurance and something that is likely to benefit you in your career. You generally want to choose this sort of insurance over money because it is going to be more likely to help you in the long run. "Will I Have the Opportunity to Advance?" Some law firms will train attorneys in how to generate business, include them in business development activities and really make an effort to help new attorneys succeed and become partners. Some law firms have enough business that there are consistent opportunities for people to become service partners. In one law firm you may be "paired" with a major partner with a huge amount of business and clout who has the ability to make you a partner. In other law firms, you may do most of your work for a partner without the clout to advance your career. In some law firms you may be brought on simply because there is a lot of work at the moment and you are being brought in with no expectation you will ever be a partner—but you may be paid well. In some law firms, you will be thrown in with a pack of wolves who will do everything they can to undermine your advancement—and in others there is enough work and potential for advancement that everyone feels safe. Attorneys being hired laterally need to understand the dynamics at play with any law firm bringing them on. Some law firms will try to protect and advance them, while other law firms will have no interest in protecting and advancing them. What are some signs you’ve noticed of a law firm that is willing to protect and advance you? If your potential new law firm has no interest in advancing you, then odds are you are going to be out of another job in the not-too-distant future. Since you will be more senior at that time, it will be even more difficult for you to find a new job, and you will have to try harder to find a group of people who will support and help you. You may be out of work for some time, unhappy, stressed out and not even interested in practicing law anymore because you feel so disillusioned by the whole thing. This is what happens to attorneys who take new jobs based on money—and it often does a great deal of damage to their careers and self-esteem. You want to be around people you feel will protect you! The goals of partners with business joining law firms are quite different than the goals of associates, counsels and others in law firms who are primarily dependent on others giving them work—but not always. Just as associates will join law firms and make poor decisions based on money, so too will partners. These decisions are often something that causes disaster. A partner joining a law firm needs to have the same concerns about the law firm protecting him or her as associates do. A partner with business faces challenges being well-compensated at all points in time. It may not be possible to get guaranteed draws regardless of business fluctuations. It may be hard for a partner to hold onto his or her job if the book of business slows down. All law firm partners face challenges with compensation formulas changing during mergers or due to management decisions. Law firms are very dangerous places for partners with books of business when they are newer firms. Compensation formulas can change frequently. Disorganization in terms of hiring and finances can be punitive to the highest producers. Law firms with haphazard expansion plans may not think things through. This can be dangerous for partners with business because they will be charged for the expansion. They will also be forced to assume the costs of failure, should failure occur. Law firms with pure "eat what you kill" compensation systems are dangerous for partners with business. They usually do not promote the sharing of clients between practice groups and within the law firm. This can harm your contribution to the law firm. If you are giving up a percentage of your revenue for support, the support you receive should be first rate and you should have access to top associates and support staff. Not having this will damage your relationship with your clients, waste unnecessary time with training and create various issues you do not need. You are paying for support and should expect the best. Law firms that have a cooperative group of attorneys working together typically relate better to clients and impress them more. This fosters more client loyalty. Law firms that are operated based on money considerations and compensate partners with high draws are often over-extended. This creates issues with stability. The partner's compensation may be disrupted if billing slows down. Law firms frequently use lines of credit to compensate partners highly. This creates the possibility that the partner's compensation could be changed and directed downward during negative business cycles. Some law firms, of course, treat the bond between partners as meaningful—as they should. These firms convey the feeling that you will be taking your clients and practice to a group of people who will support and value you and the work you bring. You should feel like you are working with a group of people who are there to help you and not just take from you. Making decisions based entirely on money ignores the variety of factors that will make you succeed—or not—in a large law firm. Do you currently feel like you’re working with a group of people who support and value you? Do you feel like you’re making a difference? See BCG's Comprehensive Guide for Law Firm Partners: The Must-Have Resource for All Law Firm Partners and Future Partners for more information. 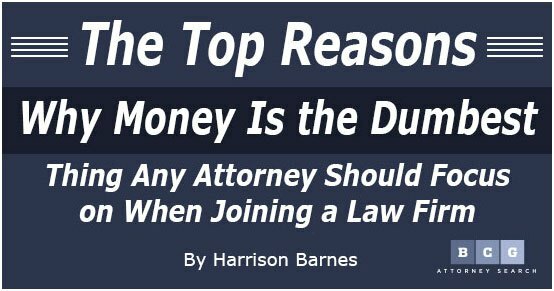 The dumbest mistake any attorney can make is often to join a law firm based on money factors—at both the associate and partner level. Money, while important, is often something that is used to mask larger dynamics and problems with the law firm as a social system. The focus should instead be on other factors such as whether the attorney feels protected, whether the attorney will have the ability to advance, and, above all, whether the attorney will be happy and able to flourish.